Preheat oven to 375 degrees F (190 degrees C). Place a baking sheet on the rack under the middle rack to catch drips. Generously butter a 2-inch deep (2-quart) baking dish. Place peach sections into prepared baking dish. Sprinkle with lemon juice and zest. Stir butter and sugar together in a mixing bowl. Mix until creamed and resembles a sugary, buttery paste, 4 to 5 minutes. Add oats and flour; stir until flour and oats are incorporated into the butter-sugar mixture and mixture resembles coarse crumbs, 4 to 5 minutes. Pour in milk; stir until mixture is wet and creamy, like a thick spreadable batter, 3 to 4 minutes. Drop batter by spoonful on top of the peaches. Spread batter evenly over the surface of the peaches. Sprinkle 1/4 cup sugar on the batter. Spritz with water until sugar is wet and surface glistens. Bake in preheated oven on middle rack until browned and crispy, about 45 minutes. Let cool at least 30 minutes before serving. To make your own self-rising flour, whisk 1 1/3 cups all-purpose flour, 2 teaspoons baking powder, and 1/2 teaspoon fine salt together in a bowl. If you don't have a water spritzer, you can use a pastry brush to moisten the sugar topping. Wonderful!! To much for two people, so I cut the recipe in half and baked in an 8" cast iron pan on the grill. Also, added 1/2 Tsp. cinnamon to batter and 1/2 cup blueberries to peaches. 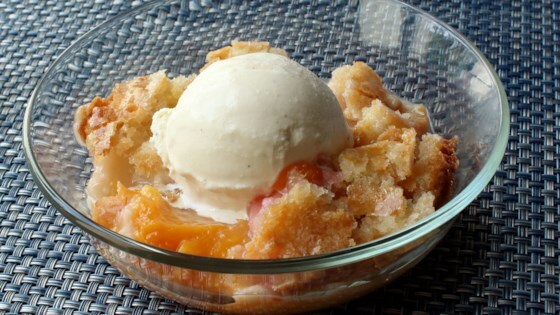 I've been making cobbler for years, but this is the best yet!